Today’s day is flat-out. There’s so much on my to-do list. Laundry, cleaning, burning CDs, editing, uploading, organizing, emailing, scheduling photo sessions around many schedules, shopping for my son’s grade 9 farewell, kid’s homework to help with, a sink of dirty dishes to sort out, company coming for supper, and the most frustrating confusing task of matching up the odd socks. What happens to the other sock? Where does it go? I don’t understand. Just yesterday I felt fabulous. I was woman, hear me roar. I even curled my hair for no other reason than to let it bounce in the wind when I went for a run. What a difference a day makes. On a side note about the busy side of this picture: let’s look at it so you can understand just how frazzled I truly am. The rose glasses? Part of a Halloween costume that I didn’t put away. Yes I realize it’s now May. That Tiara? Well, I just like wearing tiaras sometimes. It makes me feel fancy when I work. Those socks have no pair, and there’s a huge basket with more. And Brandy, that disk is yours. Anywhoooooo, as I was running in circles within my mind like a deranged chick, I had one of these lovely revelations that I’ve been blessed to see lately. You see, not long ago I visited my Grandmother in the lodge. It was just before supper time and as I walked Grandma to her seat at her table I noticed a lady sitting on a chair staring out the front doors. She didn’t move to join the others for supper and she wore an expression of longing. As I was leaving, I said hello to her and asked her if everything was OK. She quietly replied that she was waiting for her family. As I made my way to my car, I realized that many of the residents at the lodge spend a lot of time waiting. Their once overwhelmingly busy lives are now full of normality and routine. I felt guilty for walking away to the car I can drive back to my busy family. I felt guilty because I take it for granted. Yes, I take busy for granted. All these tasks I have to do in my day is because I have a purpose to some very special people. 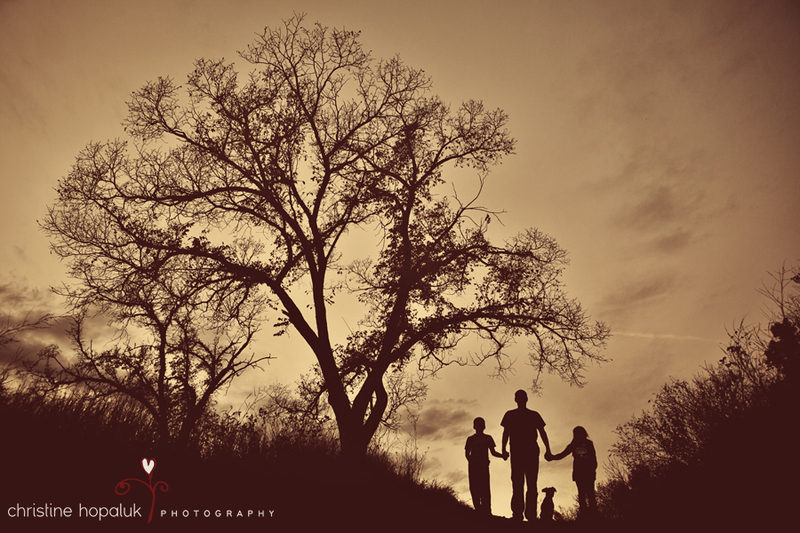 The purpose of being a Mom, a wife, a friend, a photographer of love. I am needed. I am blessed. I am an important element to the thread that holds this busy family together. In the midst of my crazy day, I just wanted to take a quick moment to share that thought with you. To all you overwhelmed Moms who master the art of being busy, we are lucky and we are privileged. I encourage you to enjoy your busy today, because I was reminded that one day life won’t be so busy. I sure will miss all the crazy….like crazy. As of tomorrow, I’ve lived 7 years at my goal weight. I can’t begin to explain to you how thankful I am for that fact. Each year when I hit my anniversary, I am even more grateful. I am grateful because I owe a huge dept of gratitude to the encouragers. The cheer-ers on. The uplifters. The positivity gushers. The glass-is-half-full thinkers. Of all the qualities I admire most in others, I believe the gift of Encouragement is the most important. It truly is a gift. We have no idea what others are going through in their life. If there’s one thing I’ve learned during the past 7 years it’s that people wear masks and hide the fact they could use a little support and encouragement. Moms live through a super-mom era, where we are expected to do it all with a smile. Us Moms are our own worst contributors to it. The gift of encouragement is small, but it means the world to those that need it most…which is all of us isn’t it? Who couldn’t use an uplifting comment? Through my life experience, here’s what I’ve observed: women attack women on various parenting and life issues. This way is right, and this way is wrong: You should breast feed. You should home-school, or you shouldn’t home-school. You should put your boys in hockey, and your girls in dance. You should dress them in brand name clothing, or you shouldn’t dress them in brand name clothing. You shouldn’t buy them an X-box. You should bring a variety of organic snacks to play group. You should never vacation without the children, or you should vacation without the children. You shouldn’t get a divorce, or you should get married. You shouldn’t have kids out-of-wedlock. You shouldn’t have a glass of wine at night. You shouldn’t write about (insert another’s values here) in your blog. You shouldn’t have plastic surgery. You’re too fat. You’re too thin. You’re too sensitive. You’re too confident. You’re too shy. On and on it goes…the destructive trail of Should’s and Shouldn’ts that deflate a woman’s confidence. If you really think about it, Shoulds or Shouldn’ts carry a lot of arrogance and ignorance. We are all wonderfully unique with a vastly different view-point on how life “should” be lived. So let’s just live it, the only way that is right for each one of us! 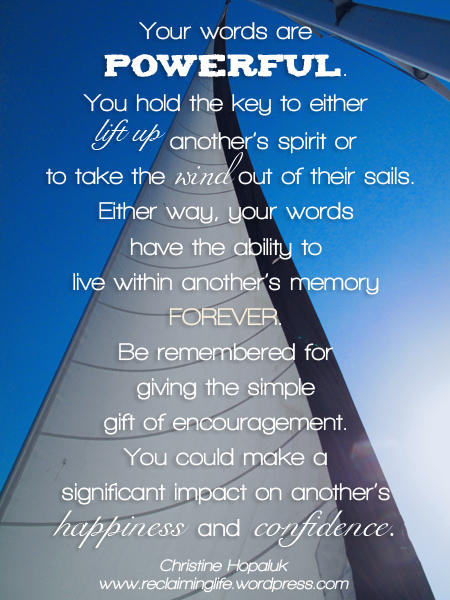 Let’s be remembered for the gift of encouragement rather than the harmful and critical words with even the best intentions…because words live on within the memory. I was reflecting over what I’ve learned since my last goal-weight anniversary, and if I could sum it up in one statement it’s this…. My point is this, here’s my resolve for going forward to the next goal-weight anniversary: I’m going to do my very best to hand out as much encouragement as I can to those I know and to those I don’t. I’m going to uplift and recognize all the amazing qualities that I sincerely appreciate in others. I’m not going to focus on the areas in other’s lives that differ from my own, because who am I to say my way is the “right” way. I’m just going to appreciate all the good in others. Positive out, positive in. Kindness breads kindness. A smile is infectious. A giving heart is beautiful. So if all you manage to achieve today is a little positivity gushing to another, I’d say that’s a day well spent. P.S. You are awesome. And beautiful. And amazing. And loved. The golden morning light filtered through the window surrounding both of us, and I sat on the edge of the hospital bed and cried. My favourite nurse walked into the room. I was embarrassed and quickly wiped my tears away with the sleeve of my sweater. Surely this was supposed to be the most exciting morning of my life! I was about to take this perfect baby home and shower him with love. I dreamed of this day since I was a little girl. But I was scared beyond belief. I was responsible for his happiness and security, and I felt completely unprepared. And then she prayed for me while I bawled like a baby. I will never forget her kindness. It was probably something she did often for new Moms she cared for, but to me it was the most unbelievable gift of encouragement during the time when I needed it most. There is no right way, just your own way. For every unsolicited bit of advice you will receive about how to “properly” care for your child, simply listen to your own voice that instinctual knows what is best for your child. Your children will flourish in your love. They will remember it. When you rest your tired eyes at the end of a busy day and think about all the things you could have done better, remember that the memories your children will treasure most when they grow up are the happy ones. They won’t remember that you burned the cookies, they will remember that you took the time to bake them cookies. They won’t remember that you were a little late for their school play, they will remember that you sat on the edge of your seat with pride-filled eyes waving back at them when it was their turn to perform. They won’t remember that your floors were dirty with watery footprints and sand, they will remember running with reckless abandon through the ice-cold sprinkler in the heat of the day and squishing the sand between their toes in the sandbox. They won’t remember the hours of overtime put in to save for a holiday, they will remember the amazing family vacation where their laughter floated on the summer breeze. They won’t remember the me-time you took away from the family to feel like yourself again, they will remember the happy Mom who returned with a revived spirit. They won’t remember the days you couldn’t get away from your responsibilities to attend their school field trips, they will remember the school events you did make it to. And they most likely won’t remember the expensive toy you caved in and bought after weeks of their insistent begging, but rather the refrigerator box you magically transformed into a space ship. They will remember family dinners around home-cooked meals, and family dinners around take-out. Sometimes us Moms need to give ourselves a break, and focus on the areas we excel, rather than the areas we lack. Because our children will remember all the brilliance, magic, and good that lived within those precious childhood years.